For the past few years, autonomous electric concepts have been all the rage on the international auto show circuit. These forward-looking vehicles tend to have boxy or egg-shaped designs in order to maximize interior volume. But every once in a while, an automaker introduces an autonomous concept that prioritizes style over practicality. The Peugeot E-Legend is one such concept. Set to debut at the Paris Motor Show early next month, the E-Legend is a modern interpretation of the 1969 Peugeot 504 Coupe. With its heavy retro styling, it’s hard not to think of the never-built Nissan IDx concept when we look at the E-Legend. Both concepts were inspired by coupes designed in the late ’60s, so any resemblance between the two can likely be attributed to the styling trends of the era. With that said, the E-Legend looks fantastic. The design is true to the original three-box coupe yet modern at the same time. We love that the raked C-pillar, quad headlights, and other details were retained, but also love the bulging fenders and more contoured hood. The concept measures roughly 183 inches long, 76 inches wide, and 53.9 inches tall, making it close in size to a BMW M4 but with a shorter 105.9-inch wheelbase. The E-Legend also gets a retro-inspired interior upholstered in ’60s-chic blue silk velvet. The door panels, seat buckets, and steering wheel feature paldao wood sourced from renewable forests and finished by French furniture design firm Hervet Manufacturier. There’s also a fragrance diffuser that can fill the cabin with one of two scents crafted specifically for the E-Legend by perfume maker Ex-Nihilo. Because this is an autonomous concept, the steering wheel is retractable. Once the wheel is stowed, the autonomous system can be set to one of two modes: Soft for comfortable cruising, or Sharp for a more “dynamic” self-driving experience. The concept also has two manual modes, including Legend and Boost. 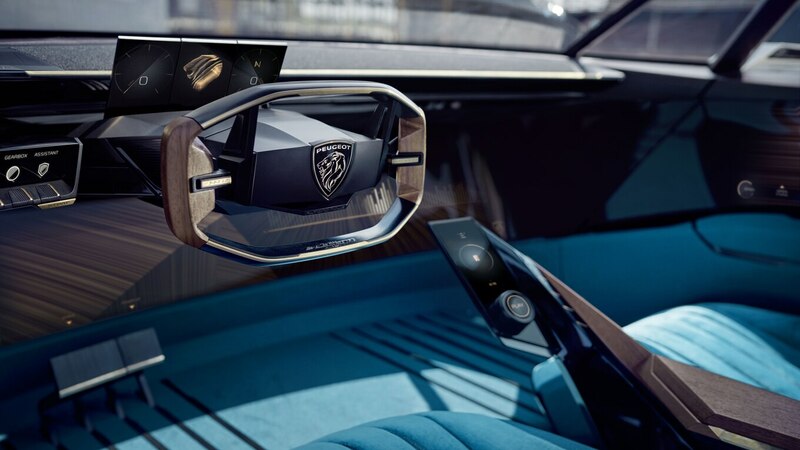 Though you have the option to drive yourself, connectivity is a major focus inside, with a giant curved central screen offering integrated video games, movies, and access to social media. The E-Legend’s all-wheel-drive electric drivetrain makes roughly 456 hp and 590 lb-ft of torque and is fed by a 100-kilowatt-hour battery pack. Peugeot says that battery provides about 373 miles of range based on the WLTP scale and can be recharged to 80 percent in 25 minutes through fast charging. Acceleration from 0-62 mph is estimated at less than 4 seconds, and top speed is pegged at 137 mph. We know it’s only a concept, and one from a brand that isn’t sold in the U.S. currently, but we hope this isn’t the last we see of the E-Legend.